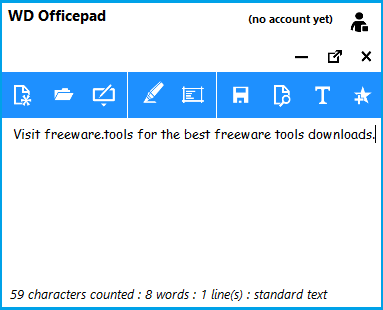 WD Officepad is a straightforward portable text editor, providing a simple option set and an intuitive layout. With its stylish-looking interface, it matches the modern GUI of Windows 8 computers. WD Officepad may not be one of the normal text editing applications that you may have likely come across while looking for one. This is because of its unique design principles and build style. From the ground up, its designed for users who want simplicity, ease-of-use and beauty right out of the box. Its just a text editor, but everything a user would really need on the spot.No installation is needed to use this tool. The application focuses on simplicity, so all its options and features are neatly displayed within the main window, allowing one-click access to creating a new note, launching an existing one, performing searches or changing the text appearance. The text editor features character, word and line counting, as well as basic text formatting capabilities to help you modify the font type and size. Thanks to the integrated search option you can easily find important keywords within your text and replace them. Notes can be saved locally or sent to the 'Favorites' section for easy future access. As a drawback, WD Officepad only works with plain text files (TXT). No other types of documents are supported, but the application does come with a proprietary format of its own, namely OPEF, which is an Officepad encrypted file. There are a few features that make this particular application stand out from the crowd. First of all, you can lock the note viewer to prevent accidental editing of your text and use the built-in clipboard manager to import pieces of text. Secondly, you can manually customize its appearance or use one of the predefined themes, so as to find a color combination of the text and the background that doesn't hurt your eyes while reading. WD Officepad can be pinned to the system tray and you can open a note in reading-only mode, which reveals a simple window with no options or menus to distract you. WD Officepad aims to provide an alternative to Notepad. This application has potential, comprising a feature set that can enhance your workflow and improve work productivity.